The big headline around financial circles this week was the fact that after facing resistance from a minority of politicians and public figures, Amazon decided to pull the plug on its planned expansion into New York City. Whatever your individual views towards the deal, the fact is that most people in the New York City area and Long Island City, where the project was to be based, were in favor of the expansion plan. In that regard, Amazon’s decision to pull out was viewed as a negative for the city and sets a bad precedent for the future when other firms weigh expansions in the region. It’s always disheartening when a project runs into resistance and fails to clear the finish line, so thankfully for bulls, the market didn’t pull an Amazon and pack up and quit when it too faced resistance heading into the week. 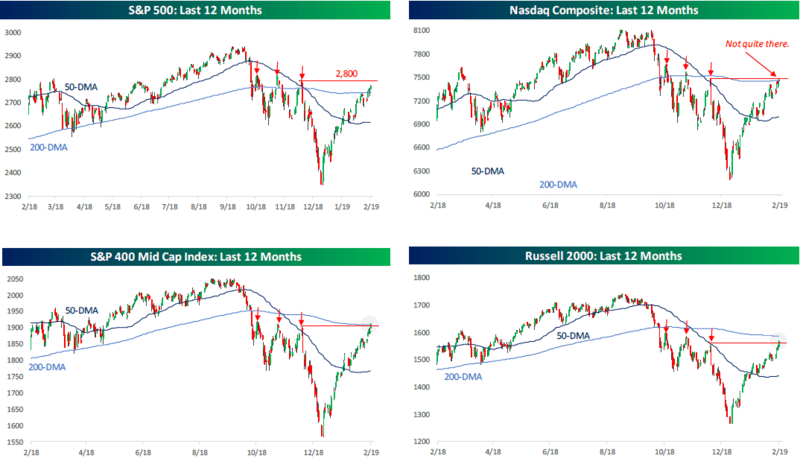 While Small and Mid Caps were finally able to take out one of the prior highs from before the December swoon (red arrows), the S&P 500 and Nasdaq haven’t quite been able to clear that hurdle. In the case of the S&P 500, though, the 200-DMA is now in the rearview mirror, so it’s a start.